Here's the perfect kit for replating solder-contaminated or damaged gold edge contacts or contacts that don't meet the minimum thickness specification. 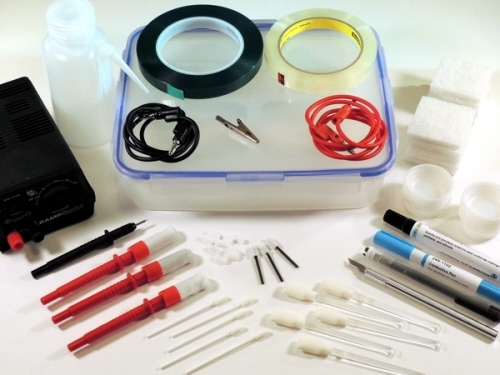 The kit includes a DC power supply and all the tools and materials needed for gold edge contact plating. Plating probes use pre-wrapped, screw-on plating anodes to end the common problems associated with loosely wrapped cotton anodes. Plating solutions are available separately.